Imparting Grace: New guest room! One of the greatest joys of the holidays is hosting friends and family from out of town. I am grateful to have an en suite guest bedroom and bath. I've made some changes to my guest room that I'm excited to show you. I made new curtains, bedskirts, Euro shams, and bolster pillows. I'm so pleased with how they all turned out! Plus I realized that a rug I already owned looked great with these new colors, so I moved it into this room. This long, narrow room is tricky to photograph, so I'll just try to show you all around. I love having twin beds in a guest room. This makes the room versatile--it's good for a couple or for two singles to share. We've had as many as four college guys sleep in this room--one in each bed, one on a cot, and one on the floor. Close-up of the pillows I made. I'm not a very good seamstress, so this took me awhile! Click here for a tutorial for the NO-SEW bolster pillow. Moving to the sitting area. The rug helps to break up the long room, I think. The end of the room opposite the beds includes the doorway to the guest bath. I love the way my new fabrics coordinate with the shower curtain I made several years ago. Here's a photo of the shower curtain. I still love this fabric. Now I'm ready for company! Who wants to come visit? Richella! How beautiful your guest bedroom is! I love your fabrics and everything in your room is lovely! I love looking at photos of your house because you execute decorating so much better than I ever could. It all looks so pulled together, and I love it! You are a real inspiration. I would love to stay in this room!! I thought that fabric was the same as my kitchen, but now I see it has an aqua background...mine is tan! Pillows came out great, love the bolsters! You are great with the sewing machine!! Your home is just lovely!! I'd like to book an entire week. 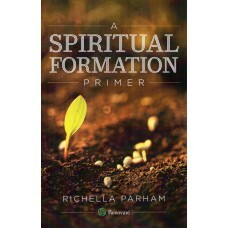 Richella, I love the changes. The drapes and pillows are gorgeous. You look like you are quite the seamstress to me. Thanks for sharing this at wow. Your guests may never leave now. Wow! This is a perfect guest room. It was beautiful before but I love the new fabrics! Makes me want to sew!!! Amazing! I love it all. You've done such a good job. What a beautiful guest room! I love the colors!! I can't wait to see how you did the pillows - you are very talented! Love your colors and pattern choices and what a seamstress you are! Nice job and you've inspired me to update my guest room. We're on our way Richella! There would be room for both Heather and myself...although the last time we stayed together in a room with twin beds we got in trouble for giggling too late into the night. LOL! This room is absolutely gorgeous and that fabric is just perfect! I absolutely love the bolster pillows. :-) You did an incredible job and we are so glad you shared it with us at Inspiration Friday this week! Beautiful job! Love the new materials ! Richella, Everything is beautiful and I love the fabrics you used. The curtains, bedskirts and pillows are all fabulous. Thank you for sharing this new look at the Open House Party. I love how your new curtains and pillows came out. Everything coordinates so well and the new pattern gives the room a more cheerful look. You're lucky to have such a nice spacious room for your guests! For not being a seamstress as you say, you did an excellent job! It looks warm cozy and colorful. me, me!! I love that blue in the fabric, Richella! It just freshens up that beautiful room. You have made sewing skills, girl. I need some lessons! Me me me :-) I love that room! And the new curtains and pillows are gorgeous. Have you shown pics of your master bedroom? I can't remember if I've seen it! Your guest room is so warm and inviting. I would never known you can't sew - great job. 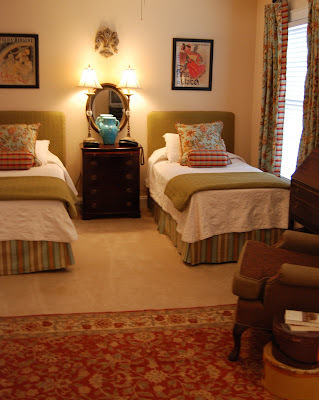 I love twin beds for a guest room -- so practical and much more versatile than a double or queen. A lovely transformation. Well done! 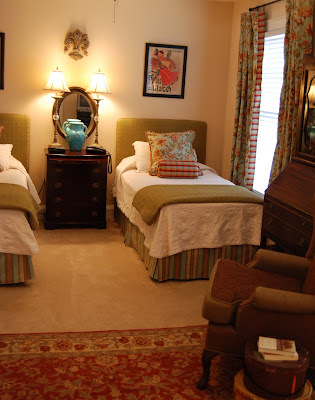 I love the idea of using twin beds in the guest room. It probably even helps the room to look larger than it really is. Great job with the new curtains. The pop of blue really adds a pop of color to the room. It's one of the most welcoming guest rooms I've ever seen! :) So nicely put together. I do, I do!!! It is beautiful! It looks more like spring than fall. I love it when rooms evolve and when things from one room can be utilized in another. Great job!! Blessings! Oh!! Sign me up for a visit, ha ha! What a truly inviting & cozy room. I LOVE how you added a reading chair which you sometimes don't see in a guest room. I LOVE to read so appreciate that little detail :) You might now end up with guests who don't want to go home! How wonderfully inviting! A truly lovely guest room Richella. I like how it all worked together, and gave it a little more color too. I would enjoy a visit in your beautiful room. But I might want to outstay my welcome in your beautiful home! I'd be out in the screened in porch room drinking my morning tea! It's lovely! Who wouldn't want to be a guest in this inviting room? Love your new curtains! Wow, that's like a bed and breakfast! I love all the changes. Isn't it amazing what a bit of new fabric can do to bring a room new life? Your guests will be thrilled to stay in that room. What a beautiful room, so very relaxing to be in I am sure! Book me in! The cushions are gorgeous - well done. I just stumbled upon this post, and your guest room is beautiful! I love the fabrics, especially, and the way that you've put them together. And you're right - the twin beds is a wonderful idea for a guest room. It's so much more versatile!